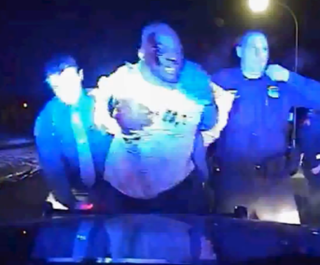 A now-former Inkster, Mich., police officer has been charged with two counts of assault to do great bodily harm after being caught on dash-cam footage beating a 57-year-old autoworker during a violent traffic stop, ClickOnDetroit reports. William Melendez also faces charges of mistreatment of a prisoner and misconduct in office for the treatment of Floyd Dent, the site notes. New video was released over the weekend showing Dent being roughed up in jail, too, after he was taken into custody. The arrest occurred in late January, when officers were seen dragging Dent out of his car. Melendez was seen putting him in what appears to be a choke hold before hitting him repeatedly in the head. Melendez was fired shortly after dash-cam video was released of the initial arrest. Dent also accused officers of planting cocaine in his car at the time of his beating, which left him with four broken ribs and a fractured eye socket, according to ClickOnDetroit. As ClickOnDetroit notes, assault to do great bodily harm is a felony that carries a 10-year sentence. I terminated Officer Melendez’s employment with the Inkster Police Department April 15, which I and others believe was in the best interest of our community. We acknowledge Prosecutor Worthy’s charging decision and will cooperate with the Prosecutor as requested. In order to preserve the integrity of both the criminal and the civil actions surrounding Officer Melendez’s employment, both of which are now active and ongoing, we have no further comment at this time on Prosecutor Worthy’s decision or our own. Read more at ClickOnDetroit here and here.